I'm not a big, in your face, Toby Keith kind of patriot, but I certainly respect those men and women in the armed forces. I even have former students who are marines! I'm sure everyone in the Atlanta area heard about the Bert Show's Big Thank You. Michelle Obama even called in yesterday to personally thank the show and listeners for writing so many letters (650,000!!). I seriously had chills this morning on the way to work. 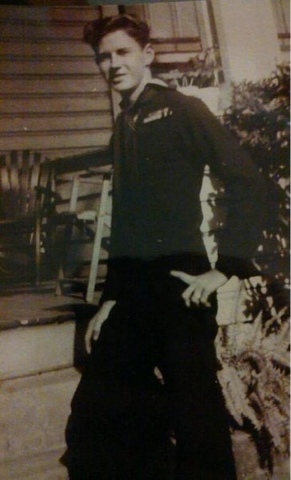 I also want to take a moment to specially thank my grandfather, Milton Hudson, for his services in the Navy during WWII. It is so interesting to hear his stories and learn more about this time in our history. Here's a great picture I stole from my mom's facebook of Pop-Pop. Isn't he a looker? Think of a veteran, a current service member, or all of the families that make a sacrifice for us daily today. It'll warm your heart.